← STUPIDITY IS AMONG US. YOU THINK? Thomas J. Churchill, “Man of a Thousand Faces”? I don’t think so. A man of many hats? Yes. But how many? Let us count them. Not necessarily in the order of importance or ability, they are actor, writer, director and producer. But if you ask this up and coming individual, he’ll insist that he has a fifth hat, that of barber, because he has been shaving his head bald for a number of years. The overall effect definitely works in his favor because it serves to give him that ‘menacing look’, a handy attribute when playing heavies, not heavy people, but heavy in the sense of, …..… if you glance at his photo below, you’ll know what I mean. Tom joined us in the Marc Graue Studio on May 5, together with my ‘wingman’ and producer, Malcolm Burman, for a friendly chat on whatever came to mind, ours or his. We peppered him with all of the usual questions, such as; When did you first decide that you wanted to be in the ‘biz’?, Which is your favorite ball team?, What do you want to be when you grow up and do you have any new projects coming out and what are you presently working on? Since Tom is from Brooklyn, as are Malcolm and myself, I must say that regardless of all the curve balls we tried to throw at him, he handled himself pretty well. In fact, we might even ask him to come back. Well, we’re thinking about it. Tom told us about how and when he first started to get interested in the ‘biz’ together with a cute story that we will pass along to all of you out there in Podcast land. When Tom was about six or seven, his father took him to an event where Fred Williamson (no relation to Joe Williamson, Tom’s agent), professional football player turned actor, known as, “The Hammer”, was in attendance. Fred was friendly, congenial and impressed young Tom to such an extent that he decided that he wanted to be just like Fred when he grew up. Fred Williamson, who was black, and still is today, remarked that no matter how hard the kid tried there was no way that he could be just like him unless he could be reborn as a black kid. 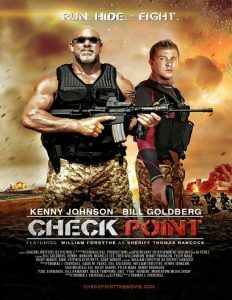 Nevertheless, years later when Tom and Fred happened to be working on the same set for, “Check-Point”, (which should be released before the end of the year), Tom, who was the writer, director and producer as well as the man in charge asked Fred, who was one of the players and definitely not in charge, if he remembered him from way back when. Fred stared at Tom as he mused on the question, held his hand to his chin while in deep thought and finally said, “Yeah, I remember you now. You were that nerdy little kid that was pestering the hell out of me asking me how does one become a movie star. It’s been so long that I forgot what I told you to do to yourself. And now you’re the man whose in charge?”. Is that a completely true story that went down that way? Well, I did embellish it somewhat, for effect as well as laughs. All kidding aside, they are good friends. I did look up the film, “Check Point”, which appears to me as one hell of an action movie that is timely and blends in with some of today’s most scariest headlines. Go see it. 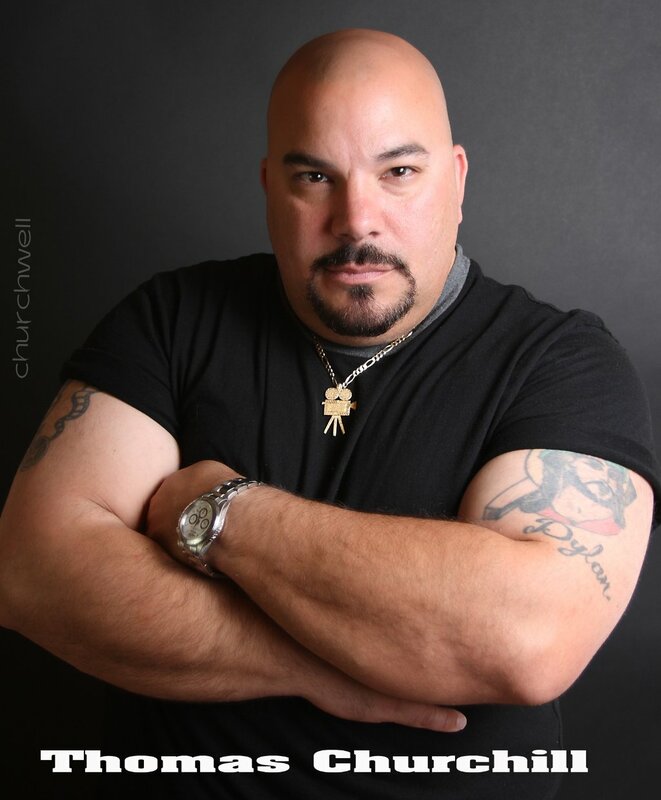 To find out more about Thomas J. Churchill, you can check him out on his IMDb, which is the official site for anyone that has any kind of movie credits. 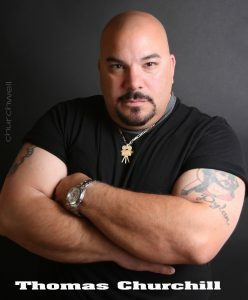 You can also reach out to him on his website at http://www.churchhillproductions.com/ or contact his agent Joe Williamson at williamsonmgmt@gmail.com. This entry was posted in Hot topic and tagged Actor, Director, Producer, writer. Bookmark the permalink.